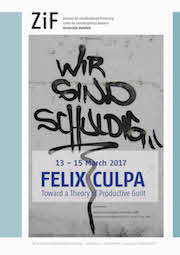 In March 2017, a group of fifteen scholars from Africa, Europe and the United States, representing the disciplines of literature, classics, history, law, philosophy, religious studies, psychology, art, and anthropology met to examine the concept of guilt as a productive force in the transformation of violent conflict, the creation of culture, and the consolidation of social order. In sometimes surprising sets of discipline-specific lectures, participants discussed theoretical perspectives on ‘productive guilt’, the intersection of collective violence and guilt, the varieties of symbolic representations and discourses of guilt across time and space, as well as the productive interrelationship of shame and guilt. The ensuing dialogue across disciplines as well as religious, cultural, and linguistic borderlines proved inspiring and fruitful. Please direct questions concerning the organisation of the workshop to Trixi Valentin at the Conference Office. Questions regarding scientific content and contributions should be directed to the organizers.